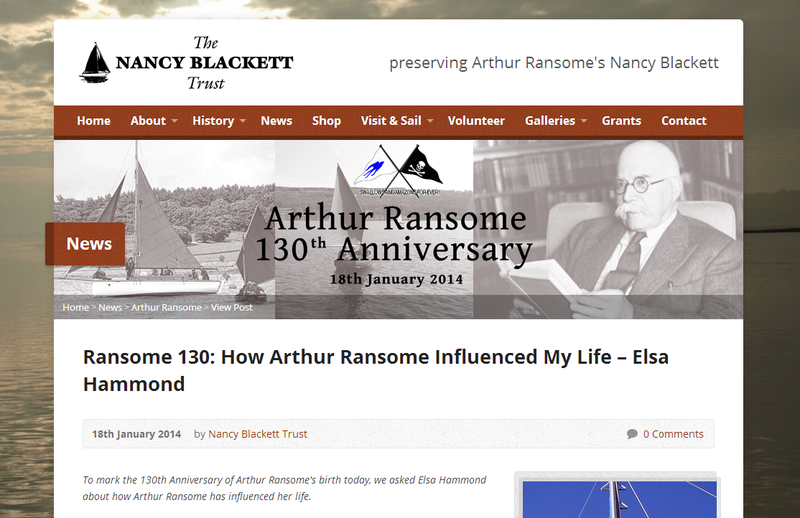 Elsa was asked to write an article about how Arthur Ransome – one of her favourite authors – influenced her life, on the 130th anniversary of his birth for the Nancy Blackett Trust. In it, Elsa writes of her love for his books, and about her adventurous childhood. Nancy Blackett was the favourite yacht of author Arthur Ransome, CBE, and the inspiration for “We Didn’t Mean to Go to Sea”, part of his “Swallows and Amazons” series, and probably his best sailing novel. Nancy, lightly disguised as the Goblin, plays a starring role as the boat at the centre of the book. Nancy Blackett is now owned by the Nancy Blackett Trust, preserving her as a living part of the Arthur Ransome heritage. Each year many Ransome fans enjoy the experience of sailing her, and many more visit her at maritime events. Previous PostWeek -21: The London Boat Show and Other AdventuresNext PostNew sponsor! Excalibur joins the team.